This review was published in the very cool, new Washington Independent Review of Books on June 9, 2011. WIRB is highly recommended. Thomas Edison, masterminding a dubious turn-of-the 20th century media event, staged the electrocution death of Topsy, an unfortunate Coney Island elephant, on January 4, 1903. Blasting over six thousand volts through the poor pachyderm, Edison, a hardball entrepreneur, demonstrated the alleged dangers of a competing technology—alternating electrical current, otherwise known as AC. Edison’s own technology, direct current, DC, was already electrifying upscale New York City neighborhoods and businesses, generating serious cash—much was at stake. Though that stunt may have won Edison the immediate public relations battle, he ultimately lost the long-term war. Alternating current, a superior and truly innovative technology, emerged on top of the heap, changed the world. QED. But Nikola Tesla, the Serbian inventor and equally showy pitchman of world-beating alternating current, a steampunk Steve Jobs, ultimately didn’t win much. He died many years later, broke and broken amidst the debris of fast lane 20th century life, a tragic genius of electrical power, his long list of inventions—alternating current, radar, wireless transmission, ubiquitous, yet somehow beyond his grasp, his interests diluted and lost thanks to his naiveté with big-time investor patrons like J. P. Morgan or George Westinghouse. Tesla, in a fit of crazed magnanimity, actually tore up a contract with Westinghouse that had entitled him to an amazing royalty of $2.50 per horsepower of electric power sold by his AC technology—not a wise move. In this charming, quirky novel, the venerable French writer Jean Echenoz tells a short Faustian technology tale, a roman a clef, of Gregor, fictionalized stand-in for the great Serbian visionary, a Beckettian lost man, one of the 20th century’s great coulda-shoulda’s. Gregor didn’t make a deal with the devil, but maybe he should’ve. Echenoz, a present master of French fiction, born in 1947, is a risk-taker, a bit of a throwback to the exotic writers of the nouveau roman movement of the 1950s and ‘60s. Zigging when everybody else was zagging in postwar relief, these writers threw fizzing bombs at conventional fiction, tossing plot, description and character under the revolutionary literary bus. Alain Robbe-Grillet, Marguerite Duras or perhaps even Samuel Beckett, produced crazy novels of pure description, cinematically detailed, with surface-only views of life, unreadable for many. For these writers, the interior world or brooding theatrical moralizing was of little interest. 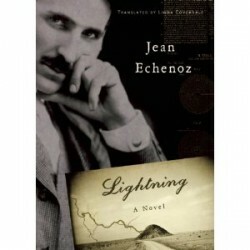 And in Lightning, (published in Paris last year as Des Eclairs, the third in a series of brief, biographical novels, Ravel, and Running, both tales of notable early 20th century lost men), Echenoz skims the sepia-toned, impeccably dressed, impenetrable surface of Gregor, a weird, asexual, lightning-obsessed, germaphobe, bird fancier—the equal of TV’s strangely brilliant Monk, the obsessive-compulsive, detail-mad detective. What makes Gregor tick? Why’s he like that? Was it because he was born under a bad sign, a cataclysmic lightning-laced thunderstorm, beautifully depicted in the novel’s opening? We’ll never know. But fear not, Lightning, is a delight to read, beautifully translated from the French into a smoothly colloquial English by Linda Coverdale. Though the tale’s load of electrical engineering wizardry detail is part of the novel’s fabric—which may be for some a bit daunting, the reader has the benefit of knowing how the big technology picture turned out. Pretty well, thank you. And English majors are welcome and may successfully apply. Really. It’s Echenoz’s narrative voice, his teller of tales present tense, chatty voice, a self-deprecating, friendly ‘I’, that does the trick, completely engaging the reader like a Donald Barthelme matter of fact Jiminy Cricket on-our-shoulder guide as we watch Gregor bumble on his picaresque journey through life—working to fulfill his lifelong dream: free energy to everybody, free energy to power the world or his visionary “wireless world system of communications.” Sound familiar? These are some goals. Echenoz deftly breaks that reader-author scrim, engaging and seductive. This, then, is the ultimate magic of this tale of invention and innovation—the words, each in their precise place, obsessive in their detail, like Gregor. We also marvel at the visionary technology, which, as always, is indistinguishable from magic. Yes, it’s a shame about Gregor (Tesla) and his tragically raw deal, but, in the end, we’re living his future and it’s rather fabulous. Lucky for us. There’s something very satisfying about that. Topsy did not die in vain. This entry was posted on Thursday, June 9th, 2011 at 2:25 pm	and is filed under Fiction. You can follow any responses to this entry through the RSS 2.0 feed. Both comments and pings are currently closed.